On air personality (OAP) Toolz who was sometimes rumoured to have lost a baby to miscarriage to hubby, who happens to be a pilot was recently pictured with Mina as many would prefer to call the two lovebirds. The name Mina is an acronym for Miracle and Nina. 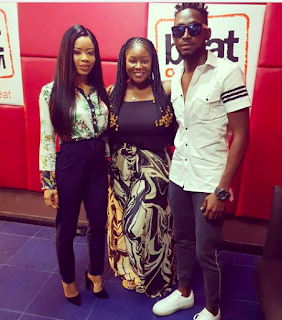 The curvy media girl, OAP Toolz, had them over for an interview and then struck a pose with the pair. Although the show might have ended but the moment after the show is what actually counts as each pair seems to be glued together as they go about their media tour. However, this isn't the first time these two lovebirds, Miracle and Nina have been spotted together just after the show came to an end but this obviously means alot to us and we can't be wrong if we decide to say that they look good together. Meanwhile, Nina and Collins are still going strong but just recently, we heard from a source that they're at the verge of calling it a quit, a rumour we are yet to confirm. With all of these things happening so fast, do you think Miracle and Mina would make a perfect match together? Well let's hear your thoughts on this via the comment section.